I’ve been collecting horror, sci fi and fantasy film books for the years and had seen the transition of generalised easy read coffee table books of the 70’s to the more detailed and focused works of today (mine amongst them). With all that new heavy stuff emerging and with the original classic films becoming more vintage and forgotten by the day, I realised that there was a gap on my shelf for a new fairly light retrospective fantasy film guide in chronological order to dip into for essential facts when necessary and remind me of that rich heritage of fantasy films and so the Fantastic Films of the Decades project began to take shape; an ambitious series of 8 books that would include classics, obscurities and guilty pleasures from the silent days to the end of the seventies. Sure you can spend time hunting this information down on the internet but now we present it in a convenient, easy to find way in this series of beautiful coffee table books. And what an exciting trip it promises to be, starting from the classic silent days of Murnau and Chaney to the birth of the blockbuster with such films as Jaws, Star Wars and Alien. Why stop there you might ask? By the end of the seventies the Gothic cinema gave way to a gluttony of modern day slasher movies and the second generation horror stars (Peter Cushing, Christopher Lee and Vincent Price) were fading away as we lost the type of film they were associated with, with the advent of such new waive classics as The Exorcist, The Omen and Carrie. For the first time in the 80’s, horror stars were eclipsed by horror characters as the genre became dominated by the like of Michael Myers (Halloween), Freddie Kruger (Nightmare on Elm Street) and Jason Voorhees (Friday the 13th). Horror stars became the thing of legend and it’s that legend we’re celebrating here. Even Ray Harryhausen had only one more in him as quirky stop motion animation gave way to all too perfect CGI. Also the 80’s and the birth of video brought an avalanche of cheap straight to video nasties, which tainted the fun and entertainment that the vintage films gave us both as kids and the crazy adults that sprung from them. Each volume runs chronologically and each year begins with a page of news headlines for that year to put the films in perspective. The year’s films are then discussed with 1-2 whole pages dedicated to each film with rare stills. 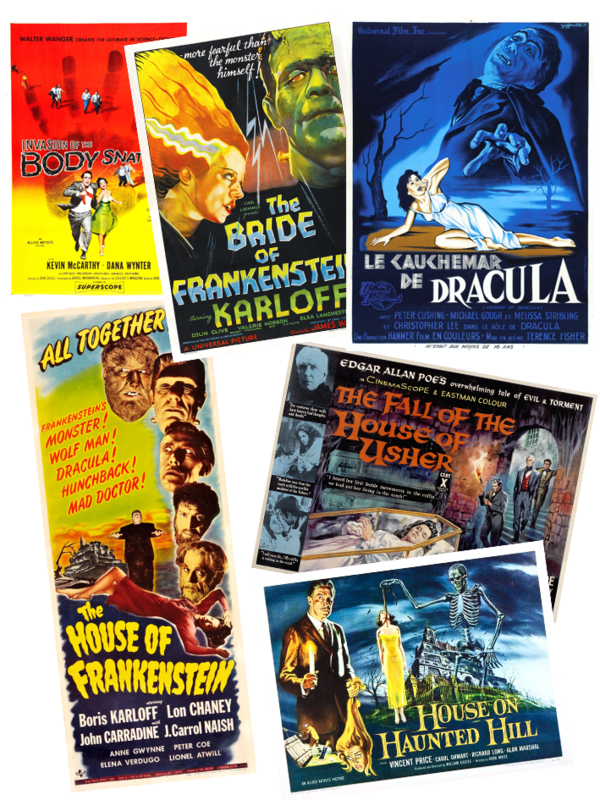 Scattered throughout are pages devoted to prominent artists and film-makers in the genre and also pages of series links where we list prominent series for convenience (eg Godzilla films, Amicus anthologies, Lugosi Monogram 9). Each volume also includes a huge sumptious colour gallery showing the poster art of the films discussed. Stay with me for the ride and I hope this 9 volume series will build up into an invaluable reference guide for the golden age of horror, sci fi and fantasy and reignite the monster-kid in all of us.